Everyone has problems—another fact of life. Isn’t that a weird fact though? Why should they? Answers can be found in religion, philosophy, science, theology, ideology, wherever your thirsty mind wishes to lap sense from. Mine personally are found in religion—I’m sure you know which. But it also makes you think about the ultimate reality doesn’t it? What is that—you tell me. When you’re in your early-mid 20’s you can’t help but wonder: where the hell am I going with all of this? Where am I going to end up, what am I going to end up doing, or how is my life going to turn out in the end? What will I have ended up being? Well does that even matter, because are you ever done ending up being? “And, The purpose of this article is?” you ask, with your skeptic eyebrows crossed with, impatience? I dunno…what’s the purpose of your life? You tell me. 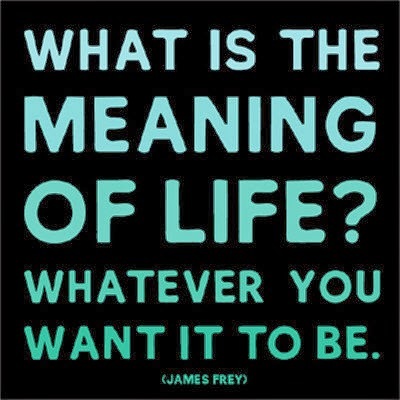 Most people find meaning in life. But people also find meaning in anything they want to find meaning in. I just think that that last line might just have been the subjective moral of this piece. Adieu. PS: If you thought this article was meaningless, you’ve tripped on a meaning drenched paradox. For the meaning of meaningless is meaningless, meaning it has a meaning. BOOM!